“What Time” is among the most important questions people ask when they’re thinking about scheduling portraits—it’s a good question. It’s also one that’s a little more elusive than it might seem. If your only consideration is the aesthetic quality of the photos, and you’re planning to shoot outside, then there’s a pretty simple and safe answer—around sunrise or sunset. But that’s not most people’s only consideration. There are also work schedules, and family, and children, and venues to think about. So, in this short blog post, lets talk about how to decide when the best time for your session is. Outdoor light (and indoor light, sometimes, depending where you are) becomes more dramatic on either end of the day. The sunlight comes from a lower, more flattering angle during those times and it gives photographers maximum flexibility and opportunity to use the light how they envision it. Additionally, during the summer these times of day are generally the most forgiving temperature-wise, and the light tends to be a little bit ‘softer’, meaning there are fewer distracting or unflattering shadows to deal with. If no other considerations matter, the best time for portraits is going to be the time about two hours before the sun sets, or for the first two hours after the sun rises. 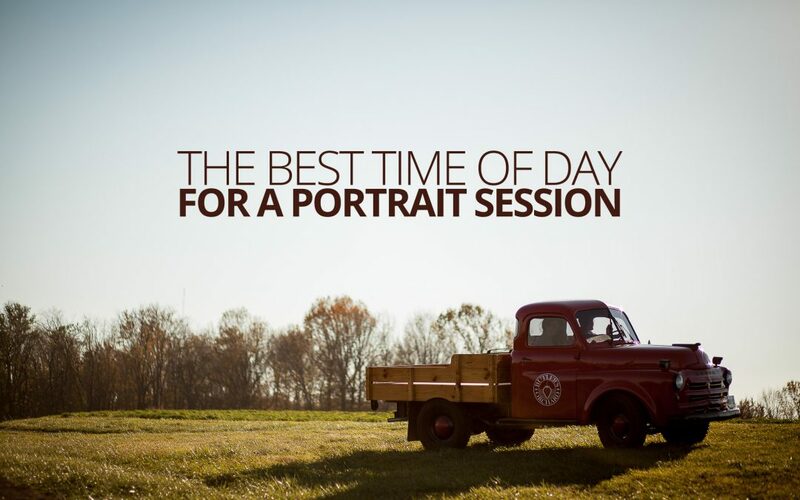 Portrait sessions, particularly those that include children, need to respect the attention span, mood-cycles, and emotional limitations of the people involved. While sunrise and sunset might be perfect times for the light, it might be the worst time for the people. Some people are early birds, sure, but there’s about an 80% chance that if I told you to be awake and cheerful at 6:30am, you’d laugh as you hung up on me. So, in this case, the best time for the shoot isn’t going to be a time when you or one of the children are likely to be grumpy, or sluggish. Do the kids nap at 11am? If so, shooting at 9:30am is probably a bad idea. Likewise, it’s probably not a good idea to plan a shoot after you get off an 18 hour shift at work—regardless of how good the afternoon light might be. Where someone’s mood is an important factor—such as during sessions with children—the best time is whenever their mood is likely to be the most positive and upbeat. For children that might be right after a nap or right after dinner; for you, maybe it’s a weekend when you don’t have work responsibilities weighing on you. Temperature is another consideration to make when deciding the right time of day for your session. In the warmer months, sunrise and sunset are great because that’s usually when the edge is taken off the heat. But in the colder months, sunrise and sunset can become daunting as the chill really sets in. Even on a very chilly day, bright sunlight offers a little respite for the biting cold. At those times of year, and especially if there are small children or elderly people involved, sacrificing the beautiful lighting for a more comfortable experience is probably worth it; a mid-day session is probably the right time. We can’t shoot if the door is locked! So, when thinking about the best time of day for the shoot, you have to think about where you want to shoot. Many public places are open 24 hours a day. But some, particularly if you have something special in mind, might have some of their own limitations. For example, a popular spot for family portraits is The National Arboretum in Washington DC. But, the Arboretum also closes its gate most days at 5:00pm. That means that during the summer, when the sun doesn’t set until almost 8:30, the arboretum will have been closed for 3 hours before the best light of the day emerges—if you want that kind of light, arriving there first thing at 8:00am is going to be as close as you can get. To know when to shoot, it’s generally necessary to know where you’re shooting, and whether you’re able to get access at an ideal time for the light, temperature and everyone’s mood.